Agile and graceful, cougars once roamed throughout most of the lower 48 United States. 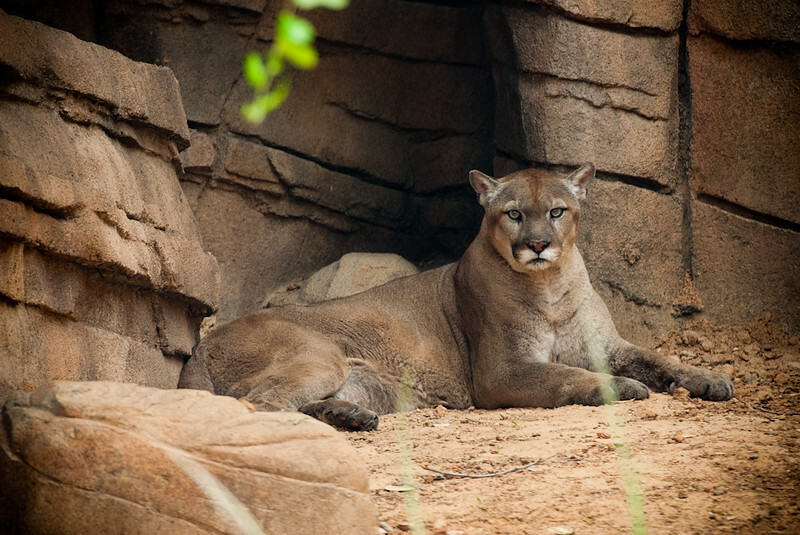 Today, cougars are found in Florida and 14 western states including Texas – and at the Houston Zoo in a brand new exhibit that offers a unique perspective on an elusive species that few have had the opportunity to closely observe. Designed entirely “in-house” by the Houston Zoo facilities personnel in concert with the carnivore care staff, the newly redesigned exhibit offers a unique viewing experience for Zoo guests. Inside a viewing area designed to replicate an old abandoned mine shaft entrance, a section of ceiling has been replaced with laminated safety glass, allowing a cougar to peer down on Zoo guests from above. At ground level, the original Lexan viewing panels that previously surrounded the habitat have been replaced with laminated safety glass inside the abandoned mine shaft viewing area and by stainless steel woven mesh outside, providing guests with a much clearer view of the animals in the exhibit. The mesh allows Zoo Keepers to safely interact with the cats and conduct training demonstrations and Meet the Keeper Talks for Zoo guests. Inside, the exhibit offers our cougars numerous climbing opportunities, a resting area that can be cooled in the summer and heated in the winter, and an environment that the Zoo horticulture team has planted with cactus representing species commonly found in the Big Bend region of West Texas. The guest viewing experience has also been improved with the removal of low metal screening that previously covered the guest viewing area. The redesign provides more viewing space and a better view of the upper elevations of the exhibit. Inside, the exhibit offers our cougars numerous climbing opportunities, a resting area that can be cooled in the summer and heated in the winter, and an environment that the Zoo horticulture team has planted with cactus representing species commonly found in the Big Bend region of West Texas.